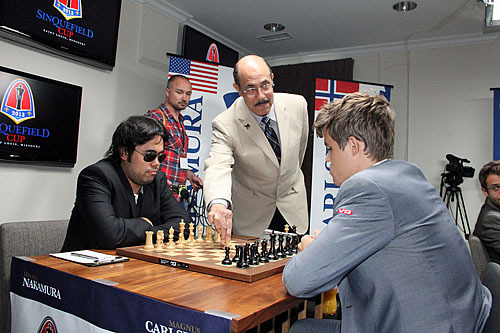 Today was a highly-anticipated round with the marquee matchup being Hikaru Nakamura playing white against Magnus Carlsen. The two players are locked into the top positions of the tournament with Levon Aronian lurking in the wings. Gata Kamsky would only fight for respectability. There has been a lot of talk about the rivalry of Nakamura and Carlsen ever since they played the legendary 30-game blitz match. Since that time, Carlsen has slowly pulled away both in rating and in head-to-head battles. 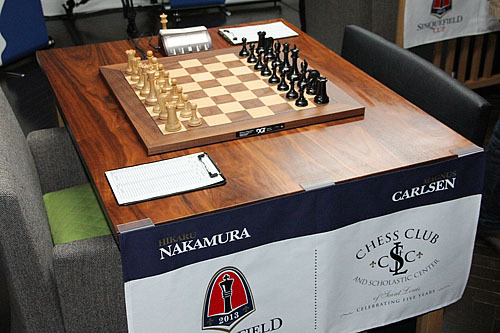 Going into this game, Carlsen had not lost against Nakamura winning seven games and drawing the rest in 21 encounters. 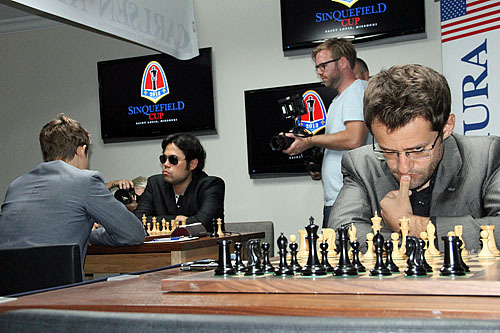 They drew a contentious game in the “shadegate” game where Nakamura donned sunglasses. There was a crush of a crowd waiting on the players. 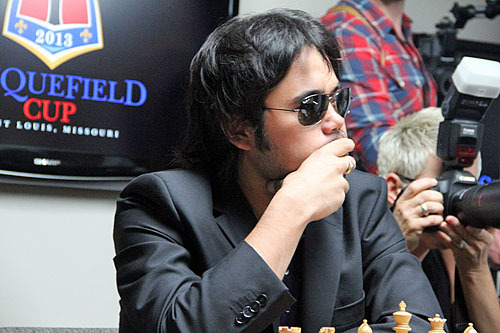 Nakamura was actually the first player in but was not wearing the sunglasses. 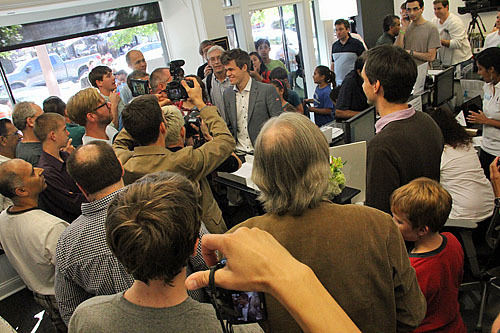 Minutes later, Carlsen entered the room and there was a shake of hands. 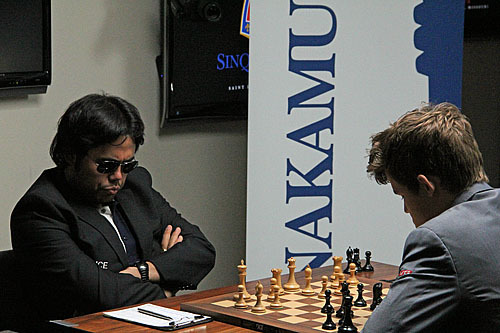 Only when the players settled in their chairs did Nakamura pull out his sunglasses and put them on! 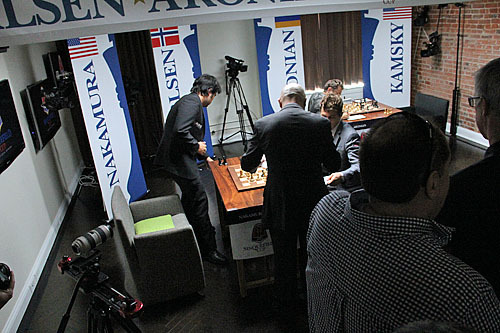 Aronian and Kamsky entered consecutively without much fanfare. Everyone knew where the attention would lie that day. Carlsen arrives with Evian orange juice! The often cherubic Aronian is now getting into game mode. Guest Arbiter Francisco Guadaloupe makes the ceremonial move. In Nakamura-Carlsen, we would see yet another Ruy Lopez Berlin which had posed Carlsen some problems previously. A very unusual “knight tour” occurred when Nakamura played 9.Nc3 Ne8 10.Nd5 Bd6 11.Re1 c6 12.Ne3 Bc7 13.Nf5 d5 14.Ne7+ Kh8 15.Nxc8. All of that to eliminate the bishop on c8?? Well… there is deep positional point that the Bf1 will exert pressure on the h3-c8 diagonal. Intensity picks up as game wears on. Black played 17…f5 stunting Nakamura’s bishop and obtained a optimal position with a knight coming on g5 to harass the light squares. The game would actually end on the light squares as the two players would repeat moves without taking undue risk. 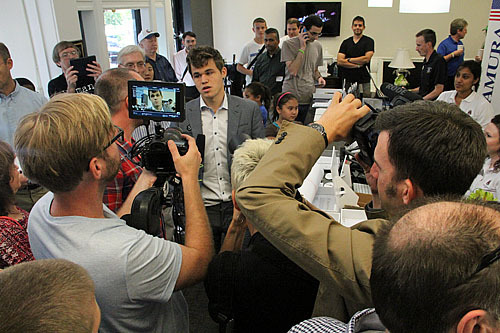 After the game a mob scene assembled to get autographs and interviews of Carlsen. It was like nothing ever seen since a certain player from Brooklyn captivated the world. In the Aronian-Kamsky game, Kamsky was still looking for his first win and essayed the Dutch Defense, an opening that Aronian bungled against Carlsen. There was the weird Bf4 move again but came up with an improvement from the Carlsen game. Kamsky was not deterred and played an aggressive stance with 15…g5!? 16. b5 g4 gaining space of the kingside… at the expense of his own king safety. 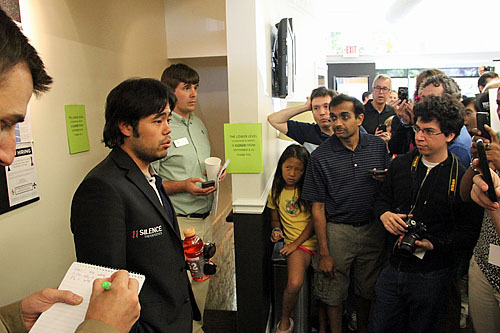 GMs Varuzhan Akobian and Ian Rogers (standing) gave the commentary at the World Chess Hall of Fame. Aronian ate what was apparently a poisoned pawn with 28.Nxh5?! and after 28. Nxh5 Qh6 29. Nf4 Rd7 30. Nd5 Rh7 black was suddenly barreling through on the h-file. However, white hunkered down and was able to get the queens off in a slightly worse endgame. Then the rooks came off with only opposite-colored bishops remaining. The players entered a truce after 44 moves. 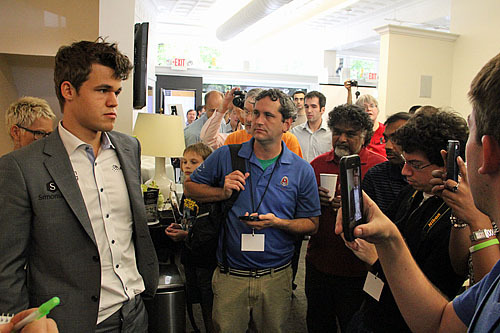 This was a momentous day in American chess. There was an excitement not seen in a very long time and it was an atmosphere that was reminiscent of a fantasyland for chess. Players come from far and wide to see the spectacle. A large crowd assembled outside of the club and there were screens everywhere. 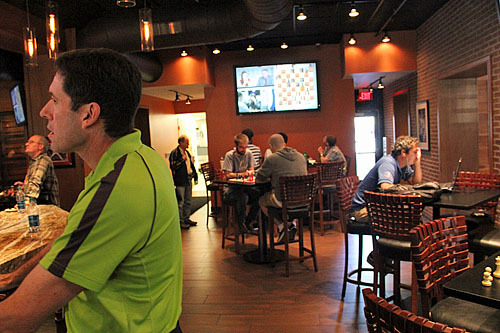 In fact, rumor has it that the tournament was being shown throughout the St. Louis area in various sports bars around town! You could catch the live commentary at Lester’s Bar and Grill next door. 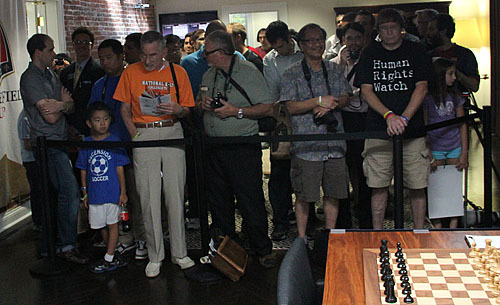 Dan Lucas, editor of Chess Life, takes in the action. Hikaru Nakamura in a post game press conference. 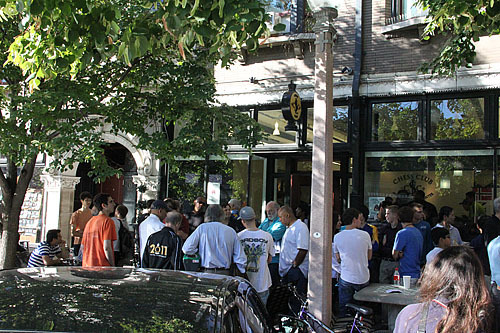 Carlsen was the subject of a mob scene on Saturday. Norwegian media were on-hand for interviews and there were countless autograph seekers. This is who they came to see. 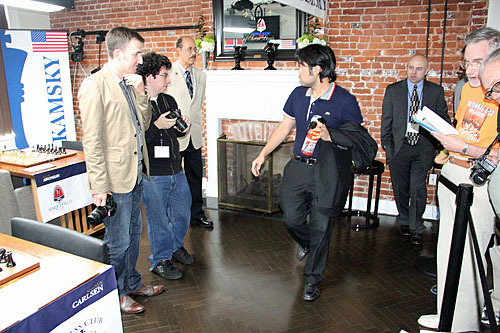 Hikaru Nakamura also mentioned in the press conference that he was recognized on the street by random people who had seen him on television. 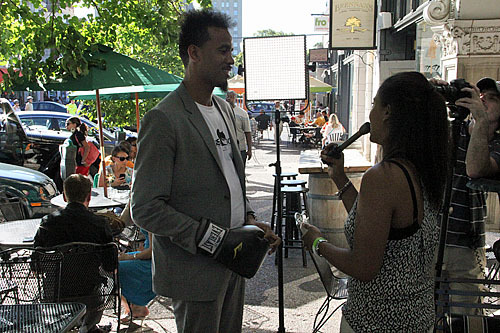 The Sinquefield Cup will expand next year and if the inaugural event is a sign of things to come, then there is quite a bit of hope for the growth of chess popularity in the U.S.
Jarrett Gaymon flew in from New York to promote “chessboxing”. Two buddies… Varuzhan Akobian and Levon Aronian share a light moment. Is that Shiva on the left? He’s everywhere! 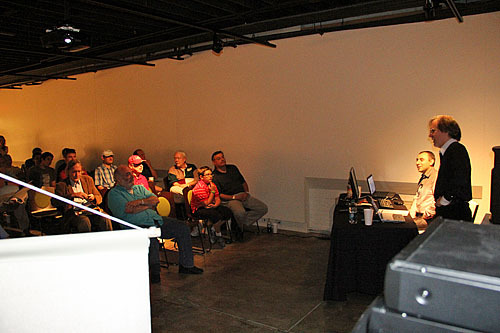 It was a great day and a celebration of chess. 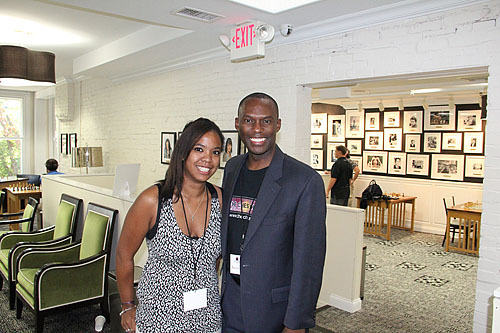 Sabrina Chevannes of England was on hand and was the subject of an interview by The Chess Drum’s Daaim Shabazz. Good pics. Looks like you guys had a blast. 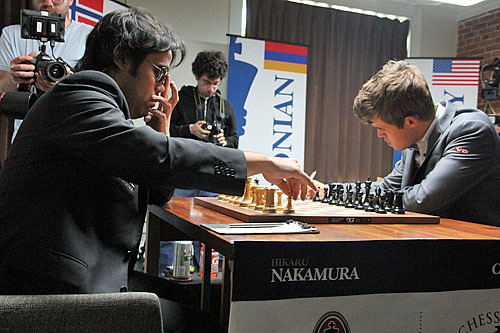 Naka needs to find a cure for Carlsen in classical games.